The summer is always the time for festivals to come through town. Summer, 2005 offered many to choose from. The weekend of June 10 through 12 proved a challenge for the indecisive. Of course, everyone and their brother (except me and Leah) made the trek up to Tennessee for Bonnarroo. Then there were those of us who remained faithful to Atlanta’s Music Midtown, which took place the same weekend. If that weren’t enough, Atlanta also hosted the first annual VIBE MusicFest. The VIBE MusicFest line-up rivaled the others from beginning to end. From Ludacris to Faith Evans, Big Boi to Lauren Hill, even Common and Kanye West made an appearance. For me, though, the group that got the least amount of “press” was the most uplifting and enjoyable. The Marley Brothers’ celebration of their Father, Bob Marley’s Life of work touched me on the deepest part of my soul. 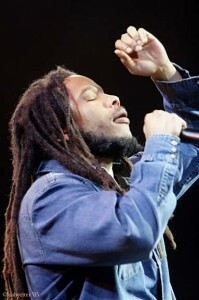 The actual sons of Bob featured in this particular event were Stephen Marley and Damian “Jr. Gong” Marley. From the first note of the introduction of the Marley celebration, I knew that VIBE MusicFest was in for a Kingston-style treat! The Marley Brothers were the first of the night on Saturday night, but brought the energy of a headliner. We were first introduced to Bob’s youngest son’s 1996 “Mr. Marley,” which is obviously a shout out to his father and the music he left behind. 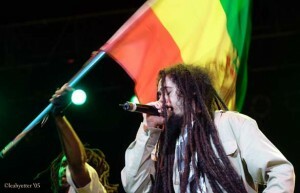 Damian Robert Nesta Marley a.k.a. “Junior Gong” started the show with high energy and a heavy reggae vibe on some of his solo material. 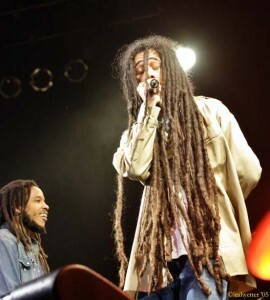 Stephen then joined Damian onstage for a “Marley Brothers” version of the classic “Kaya.” Both of these boys have their own voice, unique to them only. However, when Stephen hit the stage with one of Bob’s signature outfits, the jean shirt and jeans, I could have sworn there had just been a resurrection. Stephen and Ziggy Marley are the spitting image of their Father, so every time I see them play music, I can’t help but wish Bob could walk out and join them for a few songs. One day. No matter where I am, or who is playing it, when “Jammin’” comes through the speakers, I can’t stop my body from moving and skankin. Stephen and Damian perform with such spirit, the VIBE was definitely feeling the vibe. Damian, my favorite of the boys, has the longest dreadlocks I have ever seen, and a big personality to match. I feel like his neck muscles have to be extremely chiseled in order to support all the dread flipping and head swinging he does. He is absolutely gorgeous…I wanna jam it with him! 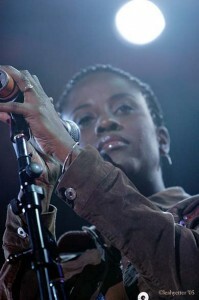 During “Exodus,” Jr. Gong broke out in the fast paced rap/reggae he has been known for. I love it when he does that. It was really more of a rap number to the tune of “Exodus.” Very cool. Singing with the boys was a wonderful female powerhouse, who was featured during Damian’s “It Was Written” from his Halfway Tree album. Stephen also joined in to sing this deep and meaningful ballad. On “Could You Be Love?” the futuristic sound coming from the keyboards brought this vintage piece right into 2005. In addition, as evidenced on the “Chant Down Babylon” album (where artists of today added their flare to the old school Bob tunes, and actually sang along with His recorded voice still there), Damian adds a modern style all his own. The guy who played the drums for them also blew us away with his precise and intricate reggae beats. During “Could You Be Love?” Stephen brought out his cute little boy to join in the reggae party. Stephen’s voice is so similar to his Father’s, at times he could actually pass for Bob. It is so nice to get Stephen and Damian’s interpretation of some of the most recognized songs their Dad left us with. 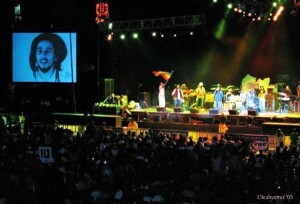 My favorite moment of this Marley party was Stephen singing and playing guitar in the Bob outfit (that we also saw Ziggy sporting on Valentine’s Day, 2004) while archived video of Bob footage played on the large screens on each side of the stage, wherein he sported the same outfit as Stephen. I was overcome with emotion to see Bob up there playing guitar and singing. The way they had it set up, the video footage actually seemed to fit, and that we were in the presence of Bob himself…in the flesh. The greatest part of that is that we were…his spitting image, at least, and definitely his spirit. I can’t express how happy it makes me to be in the same room with Bob Marley’s DNA! When the Marley Brothers’ time was up, I yearned for more, and really wished they had played much longer. Nonetheless, VIBE MusicFest was able to score a performance from Lauren Hill, as well as bring Big Boi from Outkast, Ludacris, T.I., and Faith Evans all on the same night as the fabulous Damian and Stephen Marley, so I guess I can just be happy with the little taste of Marley we got. Even though we had to leave shortly after Faith Evans started (to make MARTA to Music Midtown) I believe that we got the best of the night! As many times as I’ve seen Big Boi and Ludacris, they’ve never brought me to uncontrollable tears. What can I say, the Marley Brothers rootsROCKreggaed the house down. To take a gander at the most beautiful offspring ever to be created, go to Leah’s photo gallery at: http://www.leahyetter.com/vibe05/index.htm. You can also catch the different members of the Marley family play with the Melody Makers, Ghetto Youths, or Ziggy, Stephen, Julian, Damian, or Ky-Mani Marley as solo artists. I’d say if you ever had a chance to catch any sort of tribute to Bob Marley’s music, whether it’s from an actual member of his family, or from his former band, The Legendary Wailers, DO NOT HESITATE! DO IT!